We are conveniently located on IH 35, minutes from 1604 or IH 10. We are newly remodeled in March 2005. 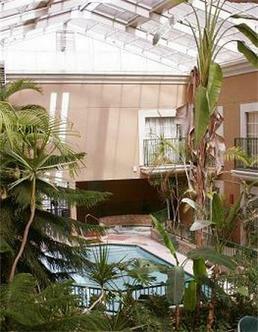 Atrium Inn is the only hotel in the area with an indoor heated pool and Jacuzzi. We have a 24 hour Dennys adjacent to the hotel and a new sports bar within walking distance. We offer our guests free wireless internet access and a business center. We have a 24 hour Wal-Mart within 2 miles. For your convenience, all rooms have coffee pots and hairdryers. Iron and boards are available.